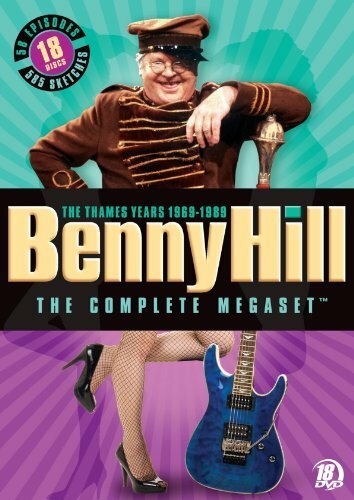 I've spent the last few days watching Benny Hill:The Complete Megaset 1969-1989. Sometimes things you get a glimpse of as kids don't really hold your attention as adults. Thankfully this was not the case with The Benny Hill Show. Although his show did include a lot of stockings, garters, sexual innuendo and cleavage it was also much more than that. There was quite a lot of wordplay, puns, satire, parody and so on. Some of this was obviously particular to a certain time and place in the U.K. but much of it was not. Hill also had a huge debt to silent film/slapstick and to Charlie Chaplin and Laurel and Hardy. There was more drag than I remembered. There was also some racial and ethnic humor. YMMV on this of course. The only saving grace is that he seemed to include just about every group in this and it wasn't often too mean-spirited. Still, times and standards have changed. That's a good thing. Hill spoke a number of languages and used accents or impressions of "foreign" misunderstandings to great affect. One running skit has Hill playing a visiting Chinese dignitary whose malapropisms would always confuse his English interviewer and convince Hill's character that the Englishman was a moron. Another had Hill playing a German man who would innocently sidle up to an attractive Englishwoman and start a conversation in which he would make "mistakes" and then want to know the proper English words for certain actions or body parts. I liked the early years best. In the later years he became sort of lazy and turned over huge swaths of the show to the Hills Angels dancers. Even so Hill and his team did a great job with humorous adaptations of "Carmen" and "Cabaret". This box set includes several interviews with various Hills Angels or other actresses on the show as well as some analysis of how Hill's show actually worked. There is some info about the decline near the end. This Coen Brothers film is not so much of a remake of the John Wayne film as it is (according to the Coen's) a more faithful adaptation of the original book by Charles Portis. It was Oscar nominated. It stars Jeff Bridges, Matt Damon, Barry Pepper, Josh Brolin, and Hailee Steinfeld. I think most people are familiar with the story. A 14 year old girl , Mattie Ross (Steinfeld) seeks justice for her father, murdered by his employee, Tom Chaney (Josh Brolin). Ross is a young lady of strong nerve who has an abiding belief in justice in this world and the next. To this end she seeks to hire a US Marshal, Rooster Cogburn (Jeff Bridges), described as the meanest Marshal available and one that has "true grit". Cogburn would rather be left alone to drink and carouse away his days. He views the idea of chasing Chaney through Indian Territory for small pay as ridiculous. But Ross is not a girl that takes no for an answer. Steinfeld's interpretation of this character is what makes the movie work. The role requires that she radiate a sense of Christian self-righteousness (Ross talks repeatedly of God's Justice), canniness about money (her mother does not read and after her father's death Ross handles all of the family business, showing herself to be a sharp negotiator), and also occasionally shocking naivete (she is only 14 after all). The Coen Brothers' (or the original author's) dialogue also draws the viewer into an austere world, one that is not easy to live in but one in which justice is harsh and inevitable. This movie is also a throwback to older Westerns and seventies films in which the filmmaker is confident enough in his work to let things slowly develop on the screen and show you things instead of telling you. This is 180 degrees away from Tarantino, so if you're looking for that style, this isn't it. This has a very Old Testament feel to it, in both language and pacing. Another remake, The Mechanic was somewhat disappointing. Actually it was very disappointing. I'm not sure why. Remake status aside, I think it was just too predictable. I mean how many films have you seen where the father figure of the protagonist dies and the protagonist finds out that some betrayal was involved. So he hooks up with an ally of uncertain loyalty to find out what happened and make those SOB's pay. We're gonna kill them all. They started it. We're gonna finish it. I'm calling you out. I'm coming for you. 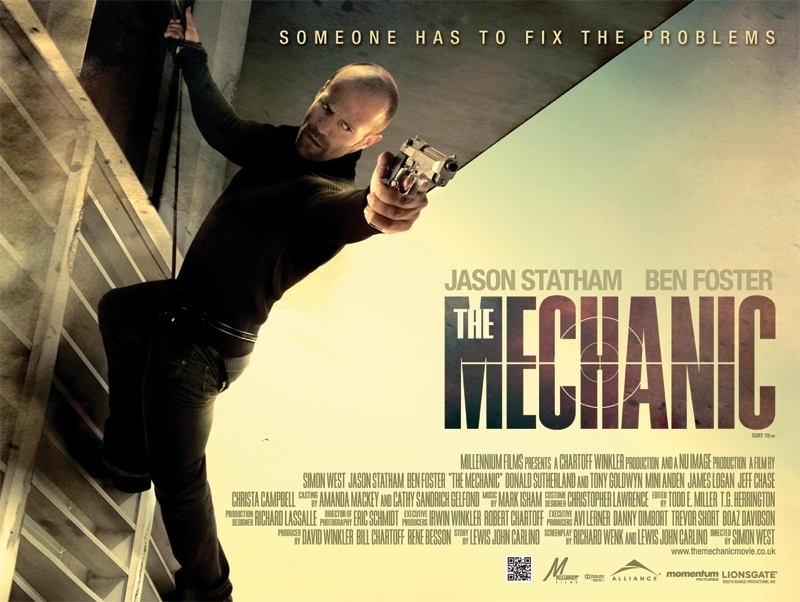 I like Jason Statham but his work here as an assassin trying to get to the bottom of a conspiracy was strictly paint by the numbers stuff. Ben Foster and Donald Sutherland didn't add very much to the story either. There's really no one to root for and so the film was emotionally empty. YMMV of course but this is really nothing new or different. I did learn that if I ever have to fight an enraged 6-6 270lb man, stabbing him in his yarbles would be a good way to equalize things but I kind of already knew that.